This is the fifth avatar of Lord Vishnu and the first avatar in which Lord Vishnu appears in complete human form. King Bali is the grandson of Prahalada . King Bali has a strong ambition to rule the entire planet and the Devas kingdom as well. He knew that reaching this goal is not going to be easy. He knew that in the past, despite Ausras’ might, Devas always emerged victorious in the end. He attributed Devas’ success to their yogic powers. So he prays to Lord Brahma with a lot of dedication and concentration. Lord Brahma was pleased with his prayers. He offers to grant any wish that King Bali asks for. King Bali thanks Lord Brahma and asks for the strength of Lord Indra. Lord Brahma grants the wish. King Bali is also a devotee of Lord Vishnu. Once the wish was granted, nothing seemed to stop King Bali. He goes on to conquer the entire planet and then goes on to conquer the kingdom of Indra (King of Devas). Devas are upset and their King, Indra, rushes to Lord Vishnu and begs Him to find a solution. Lord Vishnu incarnates Himself as a human and is born to Aditi and Kashyapa (parents of Lord Indra). And hence Vamana is the younger brother of Lord Indra. Vamana takes on the disguise of a short Brahmin (learned person) and approaches King Bali. He impresses King Bali with His knowledge and teachings. King Bali decides to offer him a reward and so asks Vamana to ask for anything (anything he might want). Meanwhile King Bali’s Guru, Guru Sukracharya, warns him that Vamana is Lord Vishnu Himself. He tells him that Vamana might ask for something that might actually destroy King Bali. But King Bali ignores his Guru’ advice and encourages Vamana to tell him what his wish is. Vamana asks for three feet of land. King Bali is thrilled and thinks that this is the easiest wish ever - not much land would be needed for a dwarf…So he does not think he would be losing much at all. King Bali agrees to grant the wish. 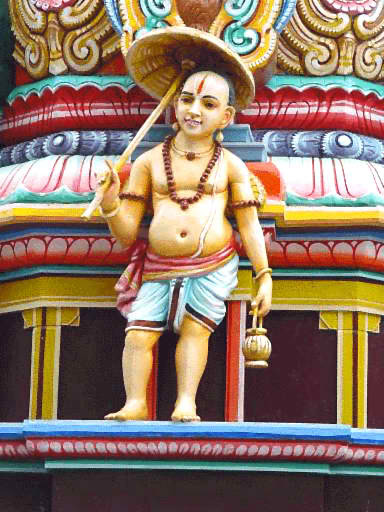 At this stage Vamana grows in size (grows huge), He grows a third feet as well. He places one feet on entire earth, one on entire heaven and then He asks King Bali where He should place the third feet. King Bali at this stage realizes that Vamana is non other than Lord Vishnu. He kneels down in awe and admiration. He prays to Lord Vishnu and then asks Vamana to place his third feet on his head. Vamana agrees. He places his third feet on King Bali and pushes him down (and in the process kills him). One of the important lessons in this story is that pride and arrogance will eventually ruin you (doesn’t matter what your connections are and whose devotee you are). Another key lesson is that material wealth can disappear in a second.